For those who pay attention to California’s renewable energy development, it’s not surprising to hear that the state is adding a lot of clean power. But how fast is it doing it? Actually, very fast. 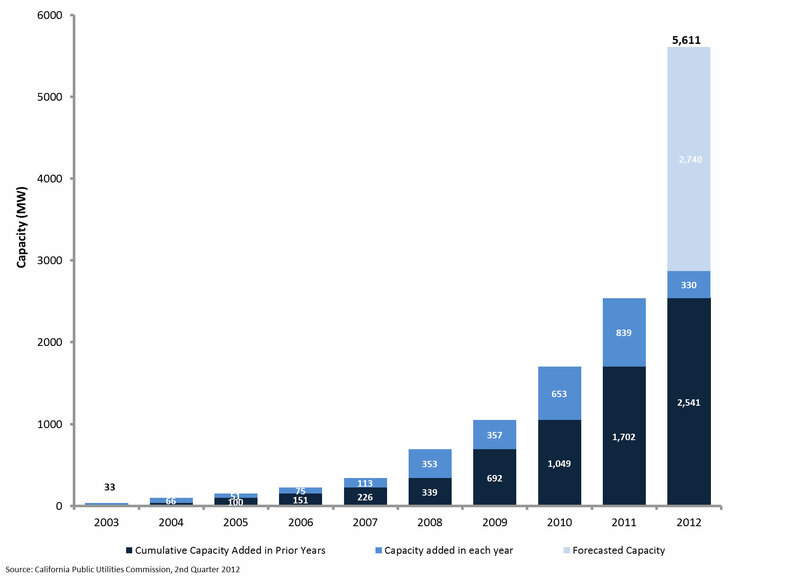 Since 2003, 2,871 MW of renewable electricity generation capacity has been installed to meet a state mandate, and about 11 percent of those came online during the first half of this year alone, according to a just-released state report. Another 2,740 MW are scheduled to come online by the end of 2012. What’s the rush? The state mandate requires its investor-owned utilities to have 20 percent of their electricity from renewable sources by 2010 and 33 percent by 2020. The three big utilities – Pacific Gas & Electric, Southern California Edison and San Diego Gas & Electric – didn’t hit that goal by the end of 2010. But then, they had a three-year grace period. One of the highlights in the report is that, indeed, the Big Three reached that goal in 2011 (they filed their procurement report to the state in March this year). It’s been a lengthy and difficult lesson for the utilities and state regulators to figure out what projects are likely to succeed, how much money ratepayers should pony up for clean power and what the overall processes should be in place to distinguish the good projects from the bad. All these efforts are on-going, of course, because unforeseen issues will always pop up that require policy makers to tinker with the rules. The report focuses only on the state’s renewable energy mandate for its investor-owned utilities, so it doesn’t include clean energy installations that fall under other state programs. For example, rooftop solar installations that serve businesses and homes aren’t counted in the report. The state’s hunger for renewable energy has made it the home to some of the largest solar farms in the country. First Solar is building a 550 MW project in San Luis Obispo County and another 550 MW in Riverside County while SunPower is working on a 250 MW plant in San Luis Obispo County. 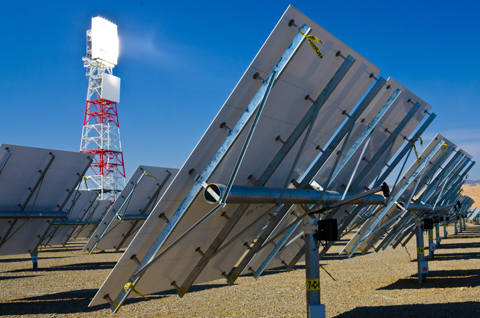 BrightSource Energy is constructing a 392 MW solar field in the Mojave Desert. But large projects tend to take a long time to secure permits and require new transmission lines to transport the electricity, all of which takes a lot of money. Besides, large projects also are more likely to attract strong opposition from environmental and community groups. California policy makers now champion smaller projects, particularly those under 20 MW. In fact, during the second quarter of this year, the clean power contracts approved by the utilities commission averaged 7.5 MW in size. California’s solar buildout can’t be called fast by any real comparison. In Q1 2012 New Jersey deployed more solar. Compare the 2.7 GW estimate for 2012 for CA to Germany deploying 1 GW *per month*. And Germany is doing it cheaper per Watt. And California has 70% better solar resources. In case there is any confusion, solar isn’t the only renewable energy that qualifies under California’s RPS program. Germany is the largest solar market in the world, but its installation rate is slowing. And that rate isn’t 1 GW per month. The forecast is 6-8 GW of PV in Germany for 2012 (Bloomberg New Energy Finance and IHS). Germany installed 7.5 GW in 201. However, 3 GW was in the month of December alone showing the pace at which distributed PV can be installed in a mature market with a forcing policy mechanism (in this case, impending FIT decline). Typo — Germany installed 7.5 GW in 2011.